Navigate Pro allows users to find all sales and purchase documents related to a starting one. Right click to see the behaviour that your partner set up for you (only for “on premises” version). Each Document can be connected to one or more other documents. The linked arrow head points to the documents logically created by the first one (i.e. invoice is created by order) or to the documents where you can link or connect lines from the original document (i.e. sales return order from Sales Shipments). Dashed line when the relationship is due to indirect operations, like item ledger entry connections (Apply to entry no., Apply from entry no.) or value entries relations. Exception: an invoice can hold 2 different documents in its header, order and quote, even if it is generated only by the order. In this case, relationship between quote and Invoice is dashed. Credit Memos are shown in the flow when they are directly linked (“Applied to”) the original invoice, because they are reversing. The system allows you to create Credit Memos in different ways: they could be not linked to the Invoices so Navigate Pro will not show them (in the image, grey icon shows the missing Credit Memo). In the example below, the Sales Return Order 1008 has been used to send back item of the Invoice (in orange): the Credit Memo created by the Sales Return Order should have been connected to the amount of the Invoice. 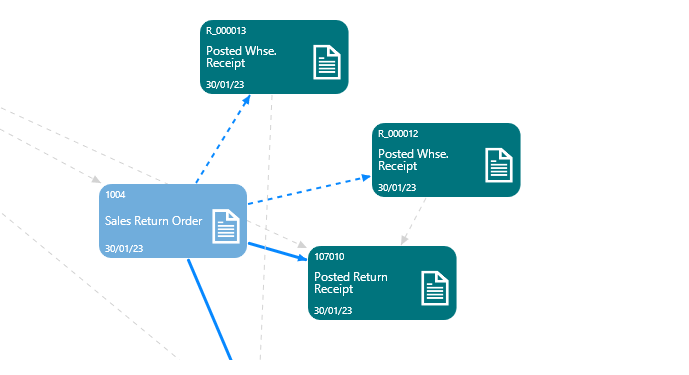 Blanket orders are not shown, since they could generate a high number of connections, and because the real tracking starts from the order generated by the blanket order. Are there any user limitations in Navigate Pro usage? Which documents are managed by Navigate Pro? Does Navigate Pro work in Manufacturing process? Does Navigate Pro work in Service process ?